The blouse shown above in soft cotton batik is one that I made a few years ago from this now "vintage" HotPatterns.com design that I tweaked a little bit to have a closer fit. This exact HP style (shown below) has been re-designed and is now offered as the HP1169 Classix Nouveau Refined Peasant Blouse...and can be seen here on the HotPatterns website. Another great peasant-style top is this one from Carla Crim, "The Scientific Seamstress"
The basic differences between the 2 patterns is that the HotPatterns style has a lovely "couture-like" flowing silhouette, with sophisticated details. The Meghan Peasant Pattern from "The Scientific Seamstress" has a silhouette that is both relaxed yet fitted, with pretty sleeve style options, neckline options, and top-tunic-dress length options. I've made them both, and I like the Hotpatterns style for soft flowing fabrics, and I like the Meghan for fabrics like lightweight cotton and soft washed linen. Making a casing for elastic is certainly one of our easier sewing tasks. Turn, stitch, insert elastic...done! 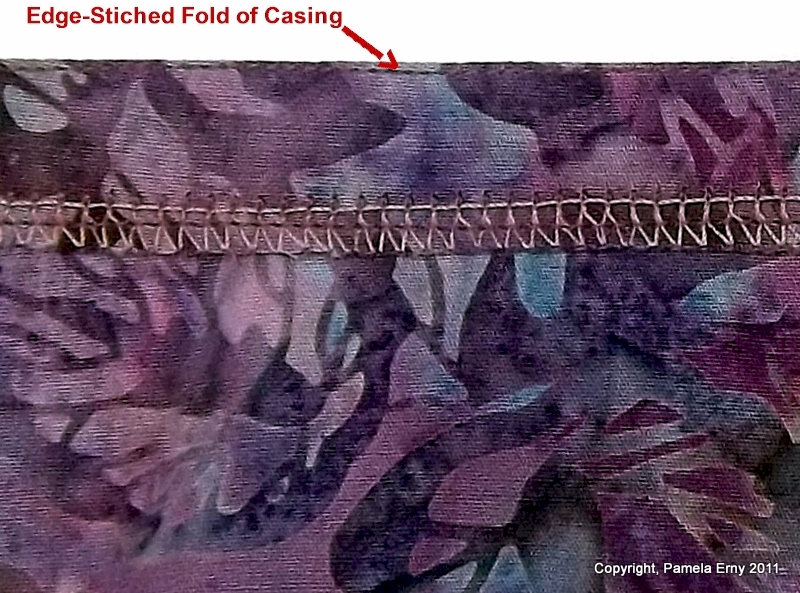 Sewn this conventional way, we end up with a perfectly acceptable casing that looks something like the photo below, after the elastic is inserted. Fine...yet a little "bubbly and wobbly"...but something we have come to accept with elasticated casings. So what's that extra construction step? Edge-stitching! and gain some designer panache!